Here are some sweet options for boys this festive season without feeling super formal. The White Company and Oeuf NYC have some lovely wintery jumpers, Childrensalon can be relied upon for full 3-piece outfits, Le Petit Germain and Bonton have some great choices for smart shirts. The Christmas jumper craze is back again this year! 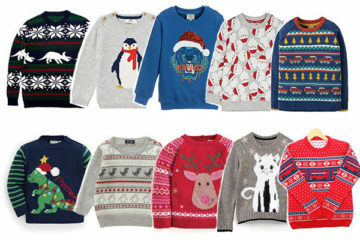 We're hoping it's here to stay - take a look at all these fantastically festive sweaters for kids! Finding stylish Xmas jumpers can be difficult, but we have narrowed it down to 3 main categories that will help you to find the ultimate Christmas jumper.